When you look at the food of different cultures it’s clear that we live in a wide, colorful and endlessly varied culinary landscape. There are however always those dishes that seem to resonate the world over with each culture boasting a version of the same theme. Flat-breads, noodles, porridge, stews, and of course some variation of savory stuffed dough. From Cornish pasties to perogies, samosas, and gyoza are all magnificent versions of the same thing, and with good reason! These foods are delicious, convenient, satisfying, and can be filled with an endless variety of fillings. 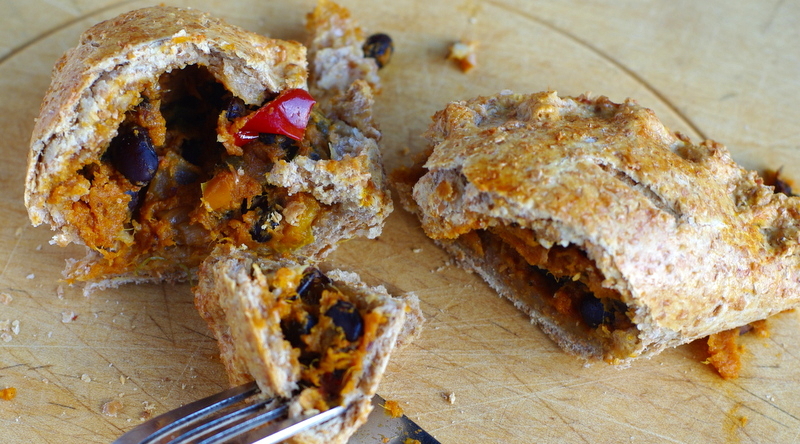 So today’s recipe is for black bean and sweet potato empanadas! Empanadas are the Spanish/Portugese take on the dish. It consists of pastry filled with meat, cheese, veggies, or sometimes even fruit, which is either baked or deep fried. There are oodles of versions with many many regional variations spanning the world from Southern Europe to the Carribean, through South America and beyond. There’s an excellent post here on Wikipedia which describes the differences and history in fascinating detail. This was my first attempt at making Empanadas, and I decided to fill mine with black beans and sweet potatoes as this is a classic and magnificent combination of flavours. I based my pastry recipe on one from Cooking Light that I found on MyRecipes.com. I used whole wheat flour instead of all-purpose in mine for a whole grain version, but stuck to the pastry laid out in the original recipe beyond that. For the filling I baked a load of sweet potatoes in their skins, scooped out their flesh and mixed it up with some beans, chopped frozen mixed peppers, lightly cooked onions, and spices. These black bean and sweet potato empanadas had a lovely crispy crust and a deep, smoky, and satisfying filling. They’re delicious! They’d be magnificent for a picnic or bagged lunch too as you can just pick it up and eat it with your fingers!! Today while writing this, I found this incredible post about Empanadas at a lovely blog called Laylita.com. The author, Layla Pujol writes recipes inspired by her native Ecuador. Her post All about empanadas: The empanada 101 guide is a treasure trove of knowledge on the subject and is absolutely loaded with ideas and leads to a huge variety of delicious looking empanada recipes, both savory and sweet. She’s even got a gingerbread pear empanada recipe! As if I wasn’t inspired by empanadas before, this one post has me raring to try out her recipes! I highly, highly recommend that you have a look. Well, I expect that you’ll be seeing more empanada posts here in the future, but until then, I hope you enjoy some black bean sweet potato empanadas!! 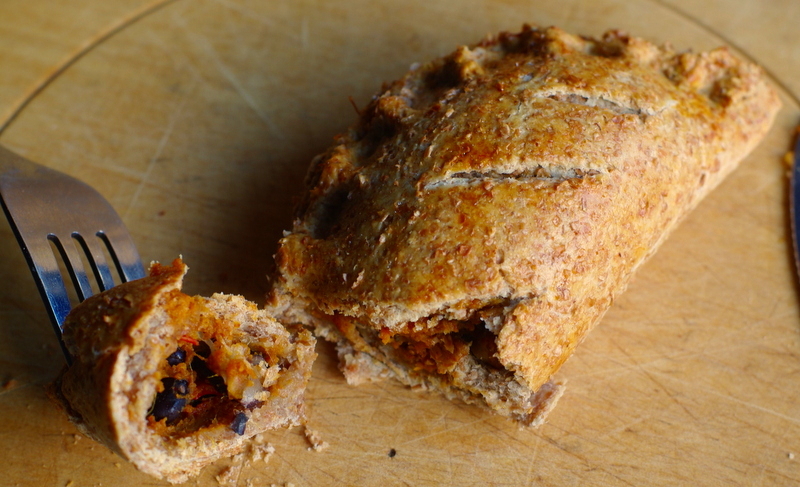 Crispy whole wheat pastry filled with a delicious spiced mixture of sweet potatoes, black beans, peppers, and onions. A healthy, satisfying and convenient meal! Place the sweet potatoes into a roasting tin and put them in a hot oven to roast until very soft, about 40-50 minutes. Once cooked, split them open lengthwise and leave to cool. Once cool enough to handle scoop out the flesh and set it aside. Meanwhile, to cook the beans, rinse them well and put them in a pot of cold water over medium-high heat. Bring to the boil, reduce the heat, cover and leave to simmer until cooked through, about 40 minutes. Once cooked drain and rinse them and then set them aside. Heat the tsp of oil in a frying pan over medium heat. Add the onion, peppers, and a good pinch of salt and cook it, stirring frequently, for about 10 minutes, until the onions and peppers are getting soft. Set them aside. To make the pastry put all of the ingredients except for the water into a food processor and blitz, adding the water a little at a time until it comes together into a ball. You may not need to add all of the water. If you’d prefer, you can do this step in a large mixing bowl with your fingers, gently kneading until it forms a dough. Once the dough is made set it aside somewhere cool while you prepare the filling. Pre-heat the oven to 180 degrees Celsius and line a baking tray with baking parchment. In a large bowl mix together the sweet potato, black beans, onion and pepper and the spices until well combined. Season to taste. Roll the dough out on a lightly floured surface to about 2mm thickness. Using a large glass (or round cutter of a similar size if you’ve got one) cut circles from the dough. You should end up with about 8. Scoop some of the filling onto each of the circles, enough that it will be full but will still leave a bit of an edge the whole way around so you can seal it. Brush one half of the edge with egg white and fold the dough in half around the filling. Crimp the edges closed by squeezing it along the open edge with your fingers. Repeat with the remaining empanadas. Once filled, place them on the prepared tray, slit the top of each a couple of times and brush each with egg white. Place them in the preheated oven and leave to bake for about half an hour, or until the pastry is cooked and deep golden. Serve hot.